Anyways, he wanted me to make a watercolor and cut-out using Rich Razzleberry and Old Olive (a fabulous combination!). 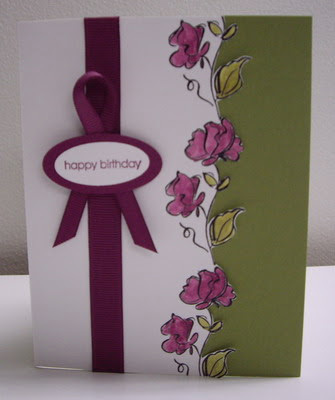 It's a fairly easy card to make and so pretty! If you don't mind doing some hand-cutting, then this is a great card for you to try! Hope you like. I started by masking the stem of the flower (Echoes of Kindness from SU!) at the bottom with masking tape (I wanted to be able to place the flowers as close together as possible so didn't want a lot of stem showing). I then inked the stamp with Craft Basic Black, removed the masking tape and stamped the image on my Stamp-a-ma-jig (this will be used for placement of the three stampings of the flower onto the front panel of my card). The reason I masked the stamping of the image onto the Stamp-a-ma-jig is that I didn't want to have any ink residue left on the stem when I went to stamp onto the front of my card. Next, I placed another piece of masking tape over the stem and inked the flower stamp again with Craft Basic Black. I stamped the image onto the larger piece of Whisper White paper, near the right hand side, just above the middle of the card. I covered the ink with clear embossing powder and used the heat tool to melt the powder. Then I repeated the process two more times: masking, inking, removing mask, stamping, and embossing ... adding the flower images, one above the first stamping and one below. When I was finished stamping the front panel of the card, I inked the image one more time (no masking this time) and stamped the image on the smaller piece of Whisper White, in the top right-hand corner - this will be the inside panel of the card. I always like to add something to the inside of a card. I then squeezed my Rich Razzleberry ink stamp pad before opening (this leaves some ink on the inside of the lid). Using the Aqua painter and ink on the inside of the lid of the ink pad, I "water-colored" the flowers on both the front and inside panels. I repeated this using Old Olive and "water-colored" the leaves. With my small, sharp scissors, I cut out along the right side of the flower images on the front panel. I then resized the front panel, trimming off a little on the left, so that I was happy with the amount of the exposed Old Olive from the card base. I attached 1/2" Rich Razzleberry grosgrain ribbon down the left side of the front panel (about 1" in from the left). I then adhered the front panel, using sticky strips, to the card base and also adhered the inside panel to the card base. I stamped the sentiment (Bitty Birthday from SU!) in Rich Razzleberry onto Whisper White and punched it with my small oval and layered it on top of a medium oval punch of Rich Razzleberry. I looped the 1/4" Rich Razzleberry ribbon and adhered with glue dots to the sentiment. Finally, I adhered the sentiment and looped ribbon to the front panel, popping it up with dimensionals.